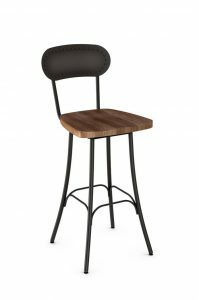 Bar Stools: Padded Seats or Wood Seats? Some wood seats come in different stains and can have an advantage over a padded seat. 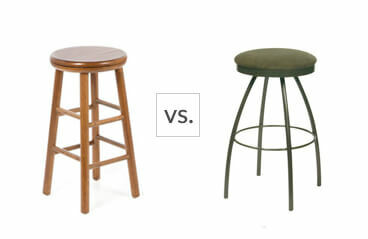 When the padding on a stool gets old or torn, it’s a little more difficult to replace. 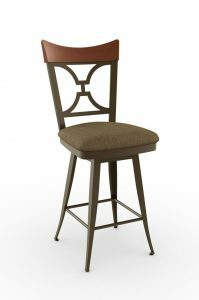 For wood seats you can purchase tie-on pads and when they need replacing, just throw them out and buy new, however; some people find that they slide or pull the tie strings off when they slip off or on the stools. Padded seats are usually scotch-guarded and are screwed down to the frame. Spot cleaning is done with a mild soap and water. If the pads become torn or old, they can be ordered through us or you can unscrew the seat pad from the bottom of the stool. Upholstery fabric can be purchased at any fabric store and you will need between a ¼ to ½ yard to recover your seats. If there is a repeat pattern or large pattern, a ½ yard is usually enough. To attach the fabric cover over the current seat fabric, pull the ends tight and fold over corners, then staple gun overlapping fabric to the bottom of the seat. Who wins when it comes to comfort? Sure enough, padded seats take down all wood, but don’t turn your back on wood seats forever — all you need is a tie-on pad and you’re ready to relax!